I can never turn down a good link up and who doesn't love to talk about the love of their life?!?! :) There are questions for single ladies AND taken ladies...so you should all play along! It will be 5 years March 9th! Crazy! We met while working together at Opryland Hotel. I was working my internship and he was working to pay the bills while he attempted to do the music thing here in Nashville. He had just started dating someone and I had just broke up with someone...perfect time to build a friendship....and we did. We were friends for a year, a year of developing a crush on each other and not knowing the other felt the same way! 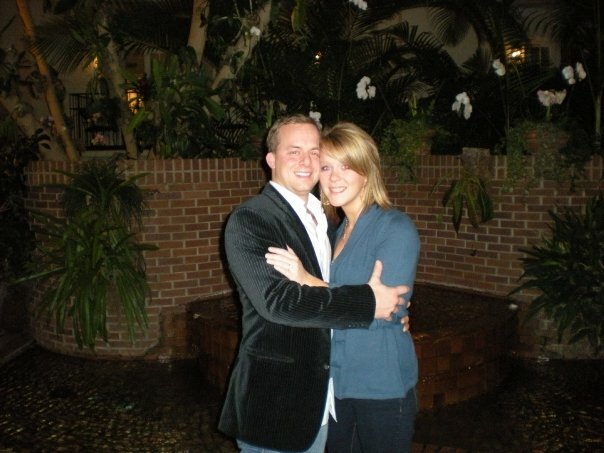 In March of 2007, I got a new job and went out to celebrate....The Hubby came to celebrate with us....and that was it. We had a little liquid courage to share our crushes and we have been together ever since! We were married here in Nashville, ceremony in our church and the reception downtown. It was awesome, everything I wanted it to be! Well, we have all the typical names, honey, babe, etc.....but we have a few special ones....Hubby used to call me Hotty Toddy (all you SEC fans will appreciate that one)/HT....he now has me in his phone as Wifey and I call him Frankie (his real first name) and Hubby, The Hubs. His good heart. He is a typical male, hard, stern and doesn't take crap....but every once and a while something or someone tugs at his heart strings and he is more caring and sensitive than me. I love him a little more those moments! I mean you should see how he is with our puppies....he is going to be such a good Daddy! He makes me laugh...on a daily basis. Even when I am mad or sad or hurt he can do something that brings a smile to my face and makes everything else seem smaller. He proposed the night before my 26th birthday - which was also the night before my big birthday party. He said he wanted to take me out to dinner, just us, since the next day was going to be crazy hectic. He took me to dinner and then to Opryand Hotel, where it all started, to look at the Christmas lights (a tradition we started the year before) so I thought nothing about it. He was fine at dinner and then while we were having cocktails at one of the hotel bars he was drinking his Jack Daniels and little quickly! :) I still thought nothing about it....we walked through the gardens and ended up making a wish in one of the waterfalls...and that is where it happened. I was looking in my purse for change and next thing I know the love of my life is down on one knee! It was so perfectly cheesy and dreamy! I couldn't have planned it better! I have much more details and in depth story here. 13. Give us one piece of advice of keeping a relationship strong and full of love. Communication is key!The Hubs and I have come a long way and have learned so much on how to communicate and speak with the other...it's amazing the difference when you know how to do this! :) And another thing I think is huge....don't take yourself too seriously. This is something the hubs is teaching me more and more everyday. I am a typical southern woman who sometimes gets to involved with "how things should be done", "keeping up with the Joneses", "how I pictured it in my head", etc....and the truth is, and cliche as it may sound, none of that crap matters. At the end of the day it is me and my hubby, and is long as we are kissing and hugging and smiling, none of that crap makes a bit of difference. One of our engagement pics....love! 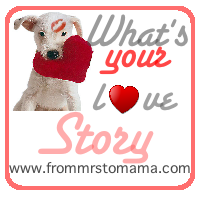 So head over to From Mrs. to Mama and play along!! I think it's so cute that he used to call you Hotty Toddy! :) You guys are such a cute couple! And isn't Jimmy Kellys delicious?! We seriously love that place! Sounds like you've got a fabulous Valentine's Day planned! I totally want to see The Vow too! Hopefully the hubby will let us :) Congrats on the pregnancy, that is so exciting! Love your blog, I'm your newest follower! hey girl! new follower after the link-up. ps LOVE your wedding dress. Great love story. I love your proposal story. Those are my favourite to read. 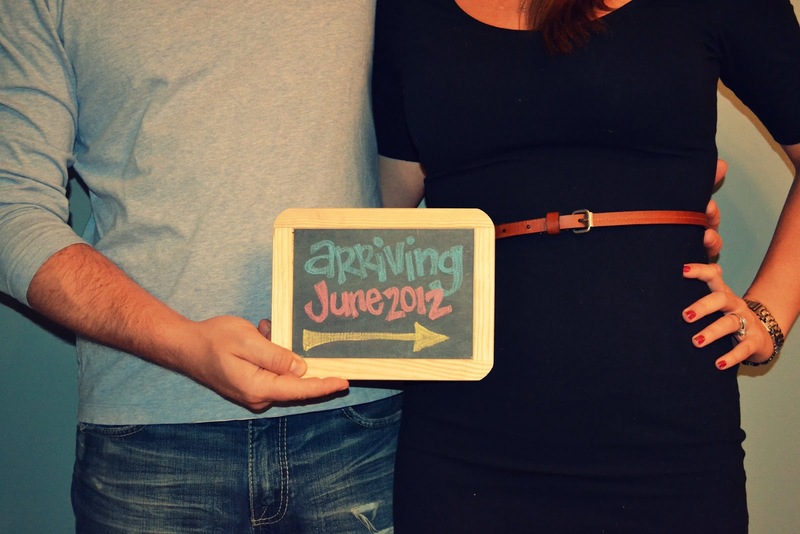 Also - I love your baby announcement - such a good idea. 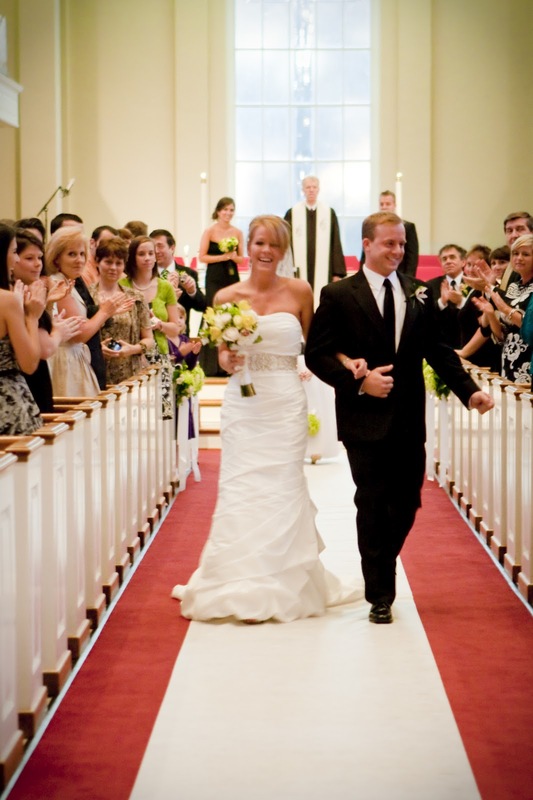 You & your sweets look so happy walking down that aisle together! Y'all look like you should be cake toppers! Oh my goodness, yall are way too cute!! Love the proposal story! Congratulations on the baby!! You guys are SO precious, and I am SO glad you linked up, and now I have another mommy blog to read! EEEK! I want to see the VOW too!! hey pretty girl! I love reading your love story again and I am so stoked your about to have a baby! You look fabulous!! I also want to see the VOW! !